YYZ Bambina: Disney's #Aladdin Diamond Edition available now! 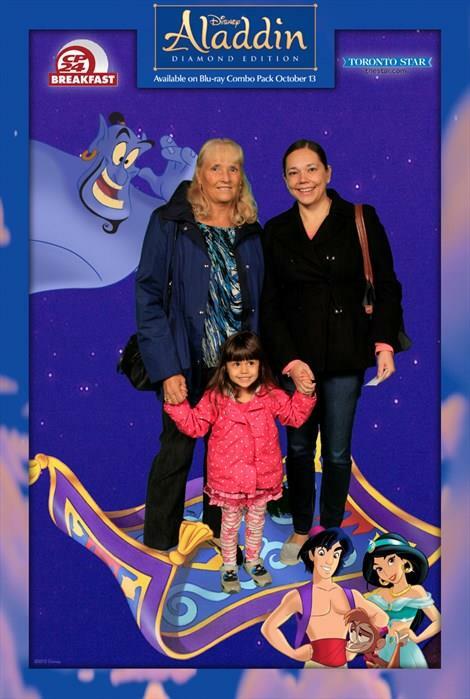 Now, like many other people, she can’t get enough of the Genie (voiced by the late Robin Williams). Thank goodness the Aladdin Diamond Edition was recently released on Blu-ray + DVD + Digital Copy – so we can watch it over and over at home and in the car on the iPad. Basically, Hannah spends the first part of the movie not-so-patiently waiting for the Genie to appear. (Fun fact, I never realized before that Williams opens the film as the peddler…so in a way, the “Genie” is the first person we see.) I enjoy the whole movie, as Aladdin is of course voiced by Scott Weinger who played DJ’s boyfriend Steve on Full House. Hannah likes Abu too, but her favourite character is definitely big blue. She also likes imitating the Genie’s mouth drop after the Genie realizes Aladdin tricked him to get out of the cave without actually using a wish. All of this makes me so excited to introduce her to other movies that feature Robin Williams, and to share with her the special features about Robin on the disc when she’s a little older. I'm also super excited to share with her other Disney movies from my childhood. Climb aboard for a magical carpet ride with nonstop laughs, action-packed adventure and Academy Award®–winning music that will make your heart soar (1992: Best Music, Original Song, “A Whole New World,” Original Score). 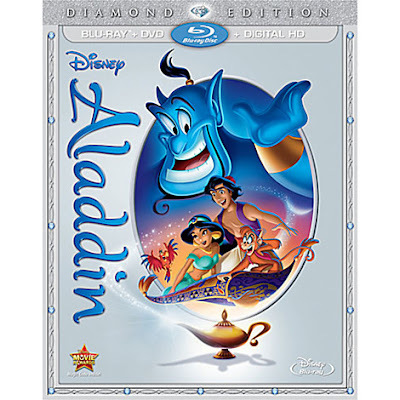 Now for the first time ever, a whole new world of Walt Disney Animation Studios’ Aladdin is revealed in a whole new way on Blu-ray and Digital HD — with never-before-seen bonus! With the help of a hysterically funny, shape-shifting, 10,000-year-old Genie, street-smart commoner Aladdin and clever, confident Princess Jasmine join forces against the evil sorcerer Jafar to put an end to his plans to take over the kingdom! I have a feeling something Genie-related will be under our Chirstmas tree. Are you fans of the Genie at your house?